← Self-portraits and making the Perfect Tow Vehicle even better! The crew and I wait out the wind. A forecast of 60 mph wind gusts keeps us at the Alabama Hills at Lone Pine, California, for another day. That’s okay. We’re in no hurry and we love it here! After breakfast Spike, Bridget, and I hike the Hills again. It’s one of those magical times when everything comes together . . . the time of day, the air temperature, the sunlight, the place, the black bird riding the air currents, its shadow drifting across the desert . . . And the three of us able to enjoy it. 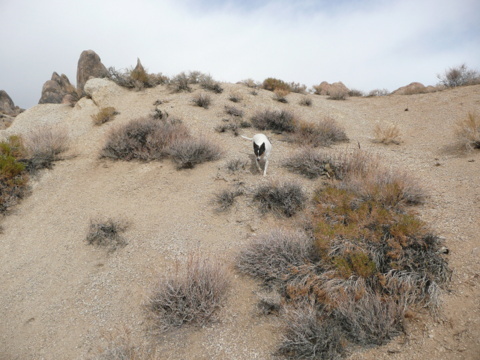 It’s a delight to watch Bridget happily follow the trail up and down sandy slopes and climb on the big boulders. Scarcely any evidence remains of her leg injury. The uneven ground is good exercise for Bridget’s leg muscles. At a high point on our hike, the wind starts. I quickly put the camera back in its case. The crew and I find a warm, still place behind a big boulder. The crew and I take a break. I lean against the rock and look out over the desert. I want to remember this for the rest of my life. There is a moment in each of our special camps, usually right before we leave, when time falls asleep and my awareness is fully awake. It’s difficult to put into words. The totality of the experience of that place wraps around me, as if I’m receiving a gift to take with us when we leave. In the afternoon we head into town. The wind is picking up. Driving down Whitney Portal Road I look south and see dust swirling in the Owens Valley. I drive over to the park and dump our trash in the bin there. As I pump gas the wind chases leaves down the street. I’m glad we didn’t get on the road today. Dark clouds roll across the sky. For a while the sky is a beautiful blue with white clouds to the east, while the mountains to the west are cloaked in . . . what is it? Fog, rain, snow, cloud cover? It’s like living between two worlds. I pack up the camp chairs and fold up the rug. It sprinkles a little bit at our camp. A rainbow appears. In the evening I read in bed while Spike snores and Bridget cuddles. I’ve been rereading John Muir (naturalist/conservationist) these past few weeks as we’ve travelled along the east side of the Sierra Nevada. His boundless wonder and appreciation for the beauty of nature inspire me. As our little home is buffeted by the wind, off and on, throughout the night, I can peer out the window and see Muir’s snowy mountains in the moonlight. 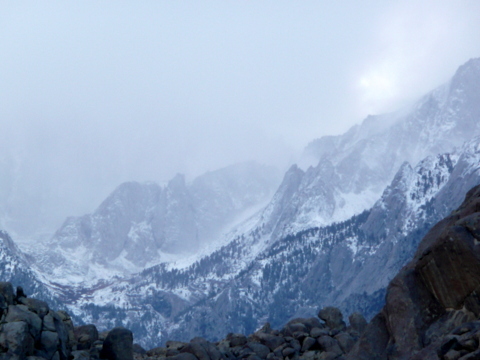 I try to imagine what it was like to spend a night in a cold, windy, howling storm up high on a mountain, as Muir did . . . I’m glad I’m in my warm, snug bed! I wonder what tomorrow will be like. We’re off to a new camp. I love setting up a new camp. Good God in heaven, thank you for this life! 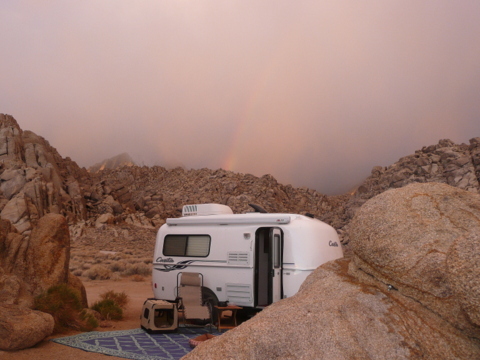 This entry was posted in Simple living and tagged Alabama Hills, boondocking, California, casita, desert, Inyo, Lone Pine, Muir, nature, photography, rat terriers, RVing, Sierra Nevada. Bookmark the permalink. LOVELY shots!! I am so happy we got to meet and you (and your lovely doggies) and managed through the storm yesterday. We were pretty protected in our little enclave down here so didn’t feel much. But the show was awesome!! GOOD travels to you and hope to meet you down the road!! Good travels to you, too! The Hills are special, arent’ they. We made it to Fossil Falls! I’ll post about it in time, of course. Sue, you couldn’t make this stuff up — it’s breathtaking beauty. You’re exactly right–it is a beautiful gift! We live in an amazing world . 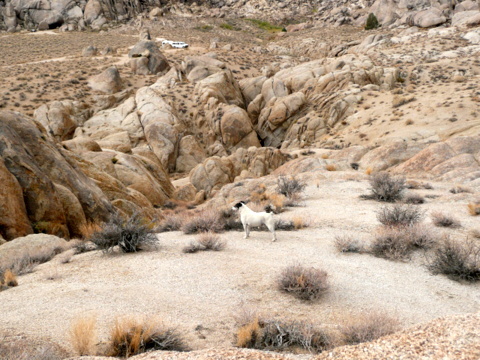 . . I’m going to post one last slideshow of the Alabama Hills. I have to share my photos! I like moving camp because I love change and making a new “nest” is fun. Glad you are on the east side of the Sierra Nevada’s, as there has been a stalled storm in northern CA. for 2 days. Chains had to be put on at elevations over 4000 ft in the mts. I watched the rain pour down on the SF game, in SanFran, last nite and thought how good it is you are on the east side. Have a good day. The only thing to look out for here, weatherwise, is wind. Very windy on the road today. You have a good day, too, Emily. Absolutely FANTASTIC pictures. God’s a great artist and you got to witness some of His best. So glad Bridget is getting better and you can take long walks with her again. Thanks for complimenting the photos, Reine. I don’t know how people can live in this world and not be grateful. Another thing I’m thankful for is little Bridget hiking with us and enjoying every minute! I look forward to having you along with us, John! Thanks for writing. I don’t hear from the men as much as I’d like. Thank you for yesterday and your beautiful words and pictures. Safe journey to you and your crew as you travel on your journey. What a blessing it was not to have to put out the big $$$$ for Bridget’s surgery–so happy she is on all four feet now. 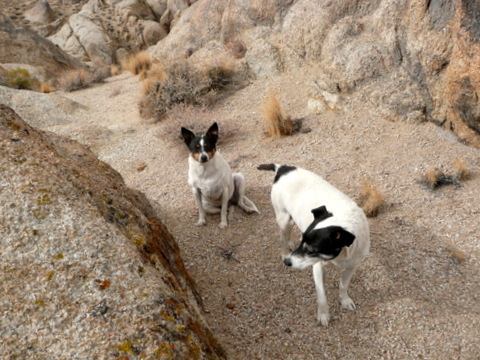 Just lovely….got a kick of Bridget and Spike hunkered down behind the boulder. Your words make it all seem so real. I’ll have to add some books to my on-the-road collection. P.S. Can I ask where and what do you do with your trash in the Casita…it always seems like it is in the way and I can’t find the perfect spot or not sure which container to use. I put the small trash temporarily in a plastic shopping bag that hangs above the sink. Then I put it in a regular garbage bag in the back of the PTV. Things like an empty kibble bag go straight out to the PTV. I’m always looking for places to dump trash so it doesn’t collect. I am new to your blog, hitched a ride with you after reading Nina’s blog. Totally enjoy everything you do and say…I have been there many times in the Sierra’s, watched those storms threaten us while fishing in Big Pine, but alas, never any real danger. In the Owen’s Valley against those beautiful mountains God protects. It is always an amazing show and I am always amazed that it seems to just blow over our heads. Good luck to you and your travels, I can’t wait to see where you land next…color me jealous and in 3 years I will be following in your wonderful life. Bless you and your great dogs. Hello, Shirlene, and welcome to my blog! I’m glad you’ll be following us along as you prepare for your life on the road. Yes, you’re right. My dogs are great. Fantastic photos! 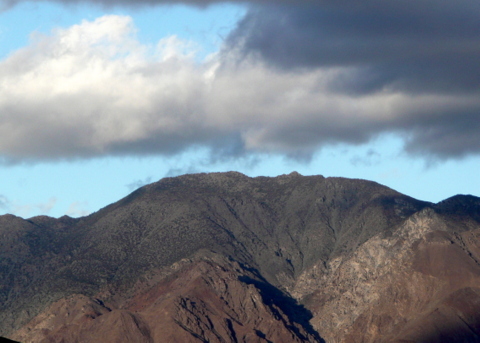 My two favorites are the ones with the circular clouds (indicates high winds aloft) and the snowy Sierra Nevada range. A lovely post with halcyon thoughts. You’re welcome, Susan. You can tell I’m having loads of fun with my new camera! What a miraculous day. I wonder if you love this camp more than any you’ve had thus far. The photos are stunning. Good for Bridget! I’ve been thinking about the camps we’ve enjoyed this past year, Kim. How can I say which one I love the most? Brooks Lake was outstanding, and the Rogue River camp, Wow!, and then there’s the Madison River where we nearly drowned! Ha! That was fun! And floating with friends on the Williamson, and camping on the North Fork of the Virgin River outside Zion near friends, and the camp on top of the mountain near Beaver, Utah, with a reservoir all to ourselves (Upper Kent Lake), and Darby Well Road and . . . I love ’em all! Gratitude….the shortest path to happiness! Thank you for sharing this special moment with all of us. Oh – and I meant to suggest the rainbow photo as your new title pic. I really could use a better pic for the header. I don’t think the rainbow pic has the right dimensions (short and wide). Great pictures, as always. I think you could make post cards out of all these beautiful shots. So glad to hear that Bridget is doing good and maybe she won’t need surgery after all. Hi Ginger, I was so worried about Bridget. Her progress is amazing. Glad you like the photos . 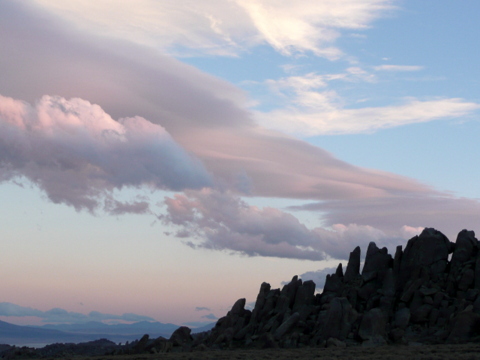 . .
And that is why I love the Alabama hills. It is so beautiful! Can’t see where you are off to next! Further south on Hwy 395 to Fossil Falls. It’s only about 40-45 miles. Ah yes I am familiar with Fossil Falls. The last time we hiked the falls we ran into a rattle snake. Do be careful with your pups. It is cold enough you may have no problems. Can’t wait to see new pictures. I appreciate the warning, Nancy. I am glad that Bridget is well and does not need the operation. Stay safe! That rainbow was more vivid in real life. I was afraid it might start to sprinkle again and I didn’t want water on my camera… so I snapped it quckly, retracted the lens, and ran back inside. This one statement perfectly describes what you do and why you do it! It’s one of those magical times when everything comes together . . . the time of day, the air temperature, the sunlight, the place, the black bird riding the air currents, its shadow drifting across the desert . . . And the three of us able to enjoy it.! I loved all the photos of the storm, from the incoming clouds to the rainbow over the BLT! Happy trails my friend! Radar’s not too good, I will email you. Sue, following your blog just gets better and better. Those photos are amazing. My favorite is the one where your little Casita is snugged in safely between the big rocks with the rainbow behind it. It was a snuggy camp! Nice of you to note improvement in my blog! Having a good camera helps a lot. Mother nature gifted you, yet again, on your extra day. So glad you have a new camera to capture these moments, and to share. Windy in Flagstaff today. So you made it back to your winter home okay. Maybe I’ll visit you in Yarnell next time I’m over that way . . . .
I’ll be there tomorrow. You are always welcome. I like storms once in a while, as long as they aren’t damaging. It makes home seem even sweeter. Thanks for the compliment on my writing. Safe travels to you, too. Sue your decriptive words really touched me and I could feel what you have felt staying amongst those awesome hills, mountains. Are you the only camper around……….it looks so isolated, like you and the crew are the only ones on earth!!! I would find that a little daunting but appreciate the sense that you get from the peace and quiet. Again your photos are fabulous……………that is quite a compact camera you have there!! So happy to hear that Bridget has mended and I bet you are now so thankful that you followed you own sense that time would heal !! I so look forward to your next camp!!! Safe travel!! From our camp I could see Nina and Paul’s motorhome. Now and again a tenter would set up in a flat area within shouting distance, but mostly we were by ourselves. Love that. On our walks the only sound was our feet crunching the coarse sand and maybe the flap of bird wings overhead. Absolute silence at night, except that one time the coyotes barked. Thanks for your comment, Glenda. Wowow!!!! What great photos! I just love reading your blog. And I love hearing from you, Colleen! I believe you experienced what I call “oneness” with the universe. When the sheer beauty and peacefulness are almost too overwhelming to put into words. I love when that happens. Wouldn’t it be something if all our moments in nature could be like that? I suppose we wouldn’t notice after a bit. I love living like this because I’m outdoors so much more than I would be if I were in a regular house. Thanks for the compliment, Page. Your Spirit Guide helps you to realize the beauty of this desert world because of your learning to appreciate the wonders. You have been blessed. Sometimes we are in touch with our higher self and then the magic unfolds. Native Americans who have been taught the old ways experience this often…if they are on the path of heart. However it happens, I treasure the times when I feel a part of the natural world, at peace and, like you wrote, blessed. Nice to hear from you, Joe. Sue, this last post and pics were so peaceful. As I read your words I felt the quiet, wind and beauty of it all. What a beautiful world. In your travels in the desert, have you encountered any snakes? The only snake I’ve seen since hitting the road in mid-August 2011 is a nonpoisonous one (bull snake? I forget) crossing the road in front of the PTV while I was looking for a boondock outside Wikieup, AZ, which is the area known as the rattlesnake capital of the U.S.
John Muir is certainly smiling. You gave me a chuckle with that one, DeAnne. You also reminded me of John Muir’s words . . . “I care to live only to entice people to look at Nature’s loveliness.” To say he was a remarkable man is a huge understatement. Even stranger–I’ve been reading him off and on for about a month, too. You are also doing a good job of enticing many of us to see the loveliness. Thanks. I enjoy reading different blogs and traveling to places with the writers. I also enjoy learning new things. I have learned an appreciation for bird watching from some blogs, an interest in history form another, along with many other things. After reading your blog today and seeing the wonderful pictures of the cloud formations, I had to look up clouds and I learned something new!! Bloggers are great! You apparently are a very “teachable” person. I once got a job because the lady interviewing me said I was teachable, whereas the other applicants thought they knew it all. I’m glad you find my blog worth reading, Donna. Your ability to capture such beautiful pictures is totally amazing. What a neat “campsite”. Living the dream..and enjoying life more…what a life you and the crew have. Thanks for letting us tag along. Glad to hear Bridget/Badger’s leg is healing. Good photos are easy with this subject matter and a good camera. I can relate to the feelings you experience when you are leaving a place that has given so much to your senses, your memories, your soul. That’s how I feel the final days before we head to our Florida home from our northern Wisconsin home. I have to walk to our dock and say goodbye to the lake. As we drive out of the area I soak in everything, as if I’ll never see it again. Thankfully, we return early every May. Sounds like you’ll return to this camp again, someday. You have your incredible photos to help you recall the scenery. Look forward to your next spot. Forgot to ask you….do you drive in to towns daily to get the internet service to post on your blog? Just curious how you get the service way out in the boondocks. I was quite surprised to find that I could pick up two bars of internet connectivity while tucked in those boulders of the Alabama Hills. At some camps I do drive into town daily to pick up service. While at Grassy Lake Road at the southern entrance of Yellowstone I had to drive several miles and through a mountain pass in order to post to my blog. What a lovely post. Great picture of the Casita and the rainbow. It looks like a movie set on Mars. Wonderful stuff, Sue and crew. You write so well Sue! That is one beautiful spot! Wonderful pictures .. so glad you made it thru the storm just fine. After reading Nina’s post about the storm, I ran right over to check on yours, but my internet didn’t cooperate yesterday. 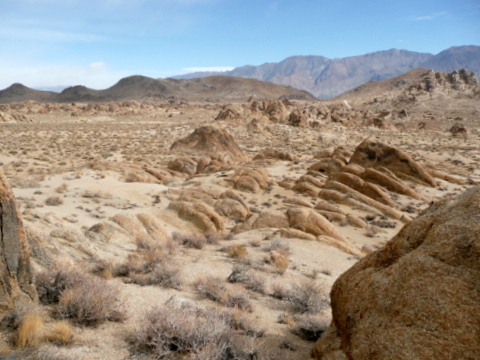 Those Alabama Hills have made it to our boondock list for someday. Enjoy ! He is a good God in Heaven and I keep asking Him what heaven will be like if this tainted world we live in is so beautiful. Sometimes I don’t ever want to leave it’s beauty but I know something better is waiting for me. I am so thankful that Bridget is doing so much be so quickly. Another thanksgiving to God because I prayed that just like the sparrow God loves so much and the healing that he promised in His word that He would have mercy on sweet Bridget and heal her as well. Yes He is a good God in Heaven. Lenticulars…. those clouds are called lenticulars. 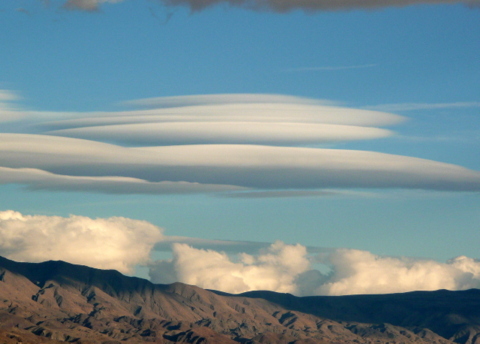 Some people think they look like flying saucers, and sometimes the clouds get mistaken for UFOs. I only see clouds, shaped by cold air masses and the mountains that cold air passes over. I have no imagination, I only see clouds. I’m so glad to read and see that Bridget is recovering from her injury. Your stories and photos are such inspiration for me to ‘get with it’ and start planning for my next chapter soon. I go by the Casita factory once a month, and I’m feeling the urge to stop in again and see what’s new.